What was St. Augustine’s role at the beginning of medieval philosophy? St. Augustine, Aurelius Augustinus (354–430) was a pivotal figure in the transition between classical and medieval thought. Some see him as the last of the great classical thinkers, whereas others claim him as the first medieval thinker. He lived through the decline of the Roman Empire, with its political turmoil and military failures, and the Roman state’s acceptance of Christianity as the official religion. Just before Augustine died, the Vandals were burning and sacking Hippo, where he was bishop. Augustine’s most influential works are Confessions, On the Trinity, On Genesis According to the Letter, and City of God. They all reflect his own faith after conversion and provide an intellectual structure for much Christian writing that followed. Although Augustine’s initial education was in rhetoric, his later studies in Neoplatonism deeply influenced his religious understanding. Still, he approached philosophy in terms of how it could serve religion, rather than as a valuable discipline in its own right. This secondary status of philosophy was widely accepted by philosophers throughout the medieval period. Augustine was one of the early Church Fathers and was canonized as a saint, by popular acclaim, as was the custom during the early centuries of the Catholic Church. 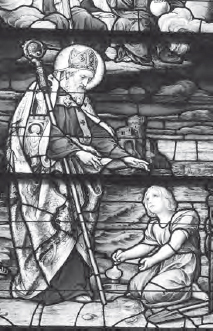 A stained glass window at the Cathedral-Basilica of St. Augustine in Florida depicts the Church ‘s namesake (iStock).